If only my high school pals could see me now!!! There I was a punk of a kid, growing up in West Virginia, long hair, and wisp of a mustache with a cigarette hanging off my lips. I’d start every morning of school on the pinball machine at the doughnut shop across the street from my high school. Oh…my grades were fine, I just wanted to look tough. You couldn’t put a book into my hands…. 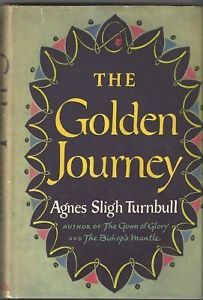 Now I find myself haunting my local library, scouring the for sale shelves for gems, like this one, “The Golden Journey,” by one of my very favorite authors in the whole world, Agnes Sligh Turnbull. I had to (gratefully, may God bless our public library,) shell out another two bits for this 303 page, 1955 “Mona Lisa, between two cardboard covers,” that was published by The Riverside Press, Cambridge. Again, Mrs. Turnbull has produced a true work of art. How I wish I could have met this wonderful author. This book, she dedicated to her husband, James Lyall Turnbull, for his unfailing interest, encouragement, and critical assistance through the years. They were wed in 1918, right before he left for World War 1. They were married until his death in 1955 from a heart condition. He was an executive in a lighting fixture company. Mr Turnbull must have been a very fine man. A favorite pastor of mine, Paul Washer, says that a husband actually has responsibility for what his wife becomes. It distrust is sown, then the wife is insecure and may never reach her potential. James Lyall Turnbull, must have truly been a wonderful husband…just look at Mrs. Turnbull. “The Golden Journey,” is the story of a father’s desperation, a daughter’s resignation, and a young man’s determination. James Kirkland, a financially powerful political star-maker, desires a husband for his beautiful daughter Anne, who has lost the use of her legs, due to the tragedy of an accident. He meets Paul Devereux, a young lawyer on the fast track up the ladder, and secures an agreement with him, that he will advance Paul’s career on the condition that he can make Anne fall in love with him, and marry him. What Mr. Kirkland doesn’t count on is the firm mettle of this man, and his own daughter’s strong willfulness. It is an incredible story of the kind of leadership that our own country so desperately needs in every branch of government today. I have often wished that the young people of this generation could somehow rediscover authors like Ms. Agnes Turnbull. Perhaps the young men, may become like Mr. Turnbull. There are so many “marriage help” books out there, but there is nothing like a good story of sheer integrity to cause a person to look inwardly at their own lives. As a follower of Christ, I am often asked about which books are best for growth? My first question, is, “What do you want to grow into?” Sometimes the answers are found not looking forward to the newest and latest, but backward to the tried and true. The ancient Hebrews had a neat way of seeing things. We western thinkers look to the future and think of the past as behind us, but the Hebrews saw the past before them, and the future behind. The past they surmise is in front of us, because we can see it. The future however is behind us, out of our vision and unknown. In addition to this, they would not worry about what they did not know, and focus on what they do know. We could take lessons. Looking to the past for answers…hindsight is 20/20. Reading books from the past, have really given me a vision for what I want my life to be. Thank you Mr and Mrs. Turnbull. You have truly blessed me. I am grateful for you. May every teen with wisp of a mustache have the chance to know you through your wonderful gift of writing! This entry was posted in fiction and tagged Agnes Sligh Turnbull, Agnes Turbull, Golden Journey. Bookmark the permalink.